Our Ph.D. student Bahram Khalichi has been selected to receive a 2018 Doctoral Research Award from the IEEE Antennas and Propagation Society (AP-S) for his research project, A Broadband Analysis of Multiscale Electromagnetics Problems Using Multilevel Fast Multipole Algorithm (MLFMA). Bahram Khalichi is working under the supervision of Prof. Vakur B. Ertürk from Bilkent University and Assoc. Prof. Özgür Ergül from Middle East Technical University. His proposed research is focused on the broadband solution of multiscale electromagnetics problems using incomplete-leaf MLFMA formulated with potential integral equations. About the Award: The IEEE Antennas and Propagation Society doctoral research grant honors the memory of Dr. Eugene F. Knott, who was a distinguished researcher and contributor to the Society. This is a highly prestigious and competitive honor for Ph.D. students in IEEE AP-S, and the goal of this award is to encourage the pursuit of careers in advanced electromagnetics. The selection committee evaluates each applicant based on his or her research project, academic record, and potential to contribute to the electromagnetics profession in the future. The award consists of a $2500 fellowship and award announcement will be featured in the Education Column of the upcoming IEEE Antennas and Propagation Magazine. Early applications for the graduate program can be made through the online application system by March 26, 2019. 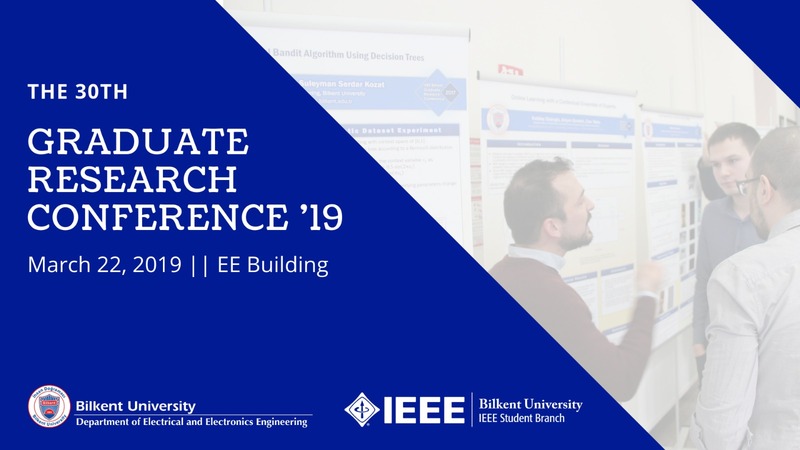 For detailed information about our department and the graduate research, you are invited to the Graduate Research Conference 2019 that will be held on March 22, 2019. The schedule of the conference may be accessed here. Our 2016 B.S. graduate Ali Devran Kara has received the Outstanding Paper Award in the 57th IEEE Conference on Decision and Control, 2018, with the paper titled "Robustness to Incorrect System Models in Stochastic Control and Application to Data-Driven Learning." The project "mobilative® UYAZ: Vision-based Flight Artificial Intelligence," in which our senior undergraduate student Hürol Volkan Kaşıkaralar has taken part, has been recognized as the most innovative project and won the "Bilkent Cyberpark Office Award" in the project contest at the 12th Ankara Startup Summit organized by Bilkent Young Entrepreneurs Society on December 16th.